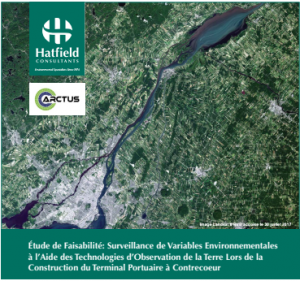 The Canadian Space Agency’s (CSA), Public Services and Procurement Canada (PSPC), and the Montreal Port Authority (MPA) contracted Hatfield and Arctus to conduct a feasibility study to identify Earth Observation (EO) technologies that would be the most suitable for environmental monitoring during the construction and operation of a new container port at Contrecoeur. The future port will be located approximately 40 km east of Montreal and have a length of 675 m capable of receiving two ocean-going vessels. An approach and mooring area will be created opposite the wharf by dredging approximately 840,000 m3 of sediment. The construction is planned to begin in 2020 and will last for three years. The study was featured this month in the Quebec remote sensing association (Association québécoise de télédétection) newsletter (in French). Hatfield and Arctus conducted the feasibility study focusing on the monitoring of four priorities environmental themes identified by the partners: (i) monitoring of total suspended solids (TSS); (ii) coastal changes; (iii) monitoring of seagrass and fish habitat; and (iv) monitoring wetlands, as well as evaluating the EO technologies that would be suitable for (v) monitoring of the construction site.